When I write a how-to book I test and re-test the instructions to streamline the wording and make sure everything is clear and works. Occasionally, I get an email asking me to clarify something, which I always answer. Occasionally, a mistake was made in the publication, and I like to be alerted to it. In some instances, a photograph of the structure is a variation of the instructions. Both structures will hold together equally well; both are equally correct. I'd like to use this post as a place to answer those instructional questions. Please feel free to ask your question as a comment, and I will answer it in the same way. That way we can all increase our knowledge. And, it is to be hoped, increase our happiness! Here is a recent question I got in email to start us out. Q: In the "X Book with Pockets" (MHB 33, 34) it looks like there is an extra tab in the photograph. Why is that? How do I make it? Cut a strip of lightweight paper approximately 1/2" - 3/4" inch wide (1.25 cm - 2 cm) by the height of the book, in this case 2 3/4" (7 cm). Before you cut the strip, make sure it will be grained long, or so that the easier fold is along the longest side. Apply glue to the back of the strip. Sandwich the edge of page 3 (should be the one with the tabbed edge that was glued together) inside the strip. Press down. For bookmaking applications, use with a mallet to create clean, straight slits for ribbons or paper closures to go through. On page 163 of your book is the description of "woven codex". The section "materials" says that you need 8 pieces of paper size 8 x 4. I think this must be 8 x 6 - is that correct? The finished book measures 4 x 6. I get asked periodically if someone already has my other books would they find new structures and info in the newest book. The new book does have many structures from the first four books, this is true. I've revised and clarified the instructions for those, adding more diagrams when I could. For many things, like boxes, the new instructions are better. That said, It also contains about 16 new structures plus statements from over 40 book artists/educators about their work, creative process, and/or the book in general. Tim was looking at the Tool Box section and wondering where he could get an architectural divider and a spacing bar. You should be able to find these with the hobby and craft supplies in a hardware or craft store with the dowels. I use 3/16" when making hard covers out of museum boards and 1/4" when using Davey (book) board. You can also use dowels, but the rods are washable and may be straighter. I just wanted to stop in to say thank you for creating such a great book! I just made a few of the "Guest Book" and I feel like i will never be stranded without a sketchbook again! I did a little video of my miniature version of the guest book, which you can see here: http://hudsonvalleysketches.blogspot.com/2011/11/what-if-you-were-stranded-somewhere.html Again, many thanks for all of your creative ideas. It looks great vertical and watching your video gave me an idea. instead of folding up the little accordion on the spine, take that section and wrap it around like the X book (you get 7 spreads instead of 3 for the X or 6 for the Guest). The cover may not completely align, however. From the same size paper, the new Guest Book comes out half the size of the X Book. And no gluing. I guess it's an "i" book now. Thanks for your comments and for your spark! Hi I came across your book making book and it was so great. I do have some questions on tips that you may have for a beginner like myself. I had trouble finding waxed thread. What kinds of paper do you recommend for journals? Thanks so much for your advice and you truly have inspired me. God Bless you! Waxed linen thread may be found through The Caning Shop, Volcano Arts, Talas and others. You can also use any thread that doesn't break or stretch when you pull hard on it. And you can use unwaxed linen and pull it through a cake of beeswax (the action is like flossing). Types of papers are described on page 19 of Making Handmade Books. I usually buy papers that fall under the category of "printmaking papers." Superfine is cheap and lighter weight. Nicer textweight papers that are also slightly textured are Zerkall Frankfurt and Zerkall Nideggen (a pretty straw color) as well as Velin Arches. Lenox or Stonehenge are good if you want thicker papers. Also, Strathmore makes a nice 80 lb. drawing paper in either white or ecru. Do you have a list of where the different tools and papers can be purchased? Thanks! You can also get there by clicking on "Book Art Resources" under "Related Links" in the sidebar to your right. When covering bookboard with paper - I always put the glue (50/50 mix P.V.A.& paste) onto the board, not the paper. Is it better to do this the other way? Many students ask me why I put the glue on the paper and not on the board. I prefer to put the adhesive on the paper so I can handle the dry board and not risk getting my fingers sticky by having to position a wet board. The sticky paper stays on the table, I know where it is, and I don't have to touch it. I feel I have more control this way. Structurally, there is no reason to do it one particular way. I wouldn't always say this, but in this case do what is comfortable and works for you. If you find what you think might be mistakes, please let me know as soon as possible. I will be submitting corrections to the publisher for future reprints. My friend Pam Hoppers and I are leading this workshop by working step-by-step through your book. P.45 the Brush book only requires one strip 2" by 11" not one. We actually preferred to cut it down to 10 inches to make it more snug, but that is not an error, just a personal preference. P.55 there is no information about how many pages to cut. We figured out that ten pieces (either regular or pocket pages) made a decent sample book to play with. We resized the storybook theater to an 8.5"x11" piece which made a delightful mini stage of books, and I took a copy of my book to Mary Kay, the owner of Stamp Camp and the book was photographed by Heirloom Productions for its blog of convention doings. Anyway, it's is a lot of fun to work through your book and we'll be at it for at least the rest of the year! Wow! Thanks so much for letting me know and please keep me posted. (p. 45) You are right about the Brush book in Making Handmade Books. For those who own the previous version of the instructions, it is correct in Unique Handmade Books. (p. 55) Slot & Tab has to have a bare minimum of two pages to work, ten pages is a good baseline, as you discovered. Twenty really shows off the spine. Once the book gets over about an inch thick it starts to lean. And it works really, really well with painted fabric, felt, or other cloth that has been hemmed. New background info for the Secret Belgian Binding (MHB p.159). Rumors had it that Hedi Kyle invented it or found a historical model. Not! This structure was invented by Anne Goy, who presented it in the 1986, and she is Belgian. Apparently, she wanted to create a binding that looked like the Japanese stab binding but would open flat. Hedi learned it from a student and they named it "Secret Belgian Binding," but the following online source says that Anne calls it "Crisscross Binding." Word from the publisher is that all of the above corrections will be incorporated into the next printing of Making Handmade Books. This book, like all books, are published in batches; when they run out, the publisher reprints them. We were lucky to get these to the publisher in time for the next run. This is still the place to post questions, and I will continue to post further corrections here. The guest book drove everyone nuts, including us. My friend Pam used to do a lot of origami and she figured out that there was a gap between step 7 and 8 images that were missing: the actual accordion folding (which involved folding one piece up and then the other to make what showed as the step 8 image from the side. The miniature tied binding pictured on page 65 used the envelope fold later in the book (we discovered that later when we were looking for an envelope). Would be nice if it included the reference to the envelope p186. We HATED the randomness of the sewing on the Sewn and Tied binding and everyone agreed it looked very amateurish, so we worked out templates instead for the holes up and down and across. We tied the ends of the 'across' sewing instead of gluing them and it looked nicer. Our books were 5" tall and didn't need boards to stay stable or straight; we figured that six inches would be a better cutoff for needing boards. Typo on page 70 under the photo: it's paper bags not paper bgas. I'm not seeing the gap in the images that you are describing, but I'm glad you figured it out with the instructions. Sorry you didn't care for the aesthetics of the Sewn and Tied Binding. Of course, those kinds of choices are up to you. Thanks for your attention to details! The addition of the boards make this a solid, chunky book, similar to Miniature Tied Stick Binding on pages 81-82. Thank you and please keep posting questions and any mistakes you find in this comment section. I am very new at making books!! Your book is the first one I am using to learn. So far it has been very helpful. As far as lightweight text papers I can't seem to find what I want. Since I use pen and ink and washes I love very smooth paper for small books. I have tried some on your lists but can you suggest something very smooth and not too heavy for small signatures?? I have tried Strathmore 500 smooth drawing and arches 90lh hot press but I would like something with even less weight. Thank you for your passion for making beautiful books by hand! My favorite lightweight paper is Velin Arches, formerly known as Arches Text Wove. It is also a favorite of calligraphers because it is cotton and can take multiple washes like a watercolor paper and don't curl up much. Nideggan, a straw-colored paper made by Zerkall, is also a nice comparable textweight sheet. They aren't extra extra smooth, though. I order them from Daniel Smith, Inc. in Seattle. A student at Susquehanna University wrote and asked how he might put a soft cover on a book with signatures. You can create a cover from cardstock or a heavyweight printmaking paper by measuring 2width of the book block (after it has been sewn) and adding the depth of the book block. Apply PVA only to the front and back covers, leaving the spine free to flex. An easier way, and a way to avoid the need for glue, is to make the Soft Wrap Cover (p.205), which is very common for poetry chapbooks and the like. A third possibility, if the depth of the book block is more than 1/2", is to make the cover for the Drum Leaf Binding that I have posted on this blog. the description of the WOVEN CODEX on page 163 & 164 says that you need 8 pieces of paper to make the signatures, plus 8 cards. Since there are only FOUR signatures - why do I need EIGHT cards? Yes, Annie, that's right. You only need four cards for the Woven Codex, one per signature. I believe I caught that for the newer editions. Sorry for the misprint in yours and the earlier ones! page 177 - Coptic with accordion; under materials: 3 pieces of heavyweight paper, each 3x10 inches. In centimeters: 7,6 x 24,5cm should be: 7,6 x 25,4 cm. I have a question about THE STOCKBOOK on page 199. The pages of this book measure: 22,9 cm. plus the strip 2,9 cm. plus the gap 0,5 cm., so in total 26,3 cm. The cover however measures only 25,4 cm. The coverstrip doesn't count because I'll have to bend that to the inside. Should the coverboard be larger? Another question: you speak of 6 linen tapes, each 4,5 inches. I think this isn't correct. Could you please help me out? Thank you for finding these. I've pulled out the actual book in the photo and measured it to find out what happened. Here are the corrections, which I will pass along to the publisher. My example has pages that align with the cover at the fore edge, and have a slight margin top and bottom. Feel free to make the pages slightly narrower in width, if you prefer a border at the fore edge as well (22.3, or 8 7/8" for example). I am having fun making my way through your wonderful book. 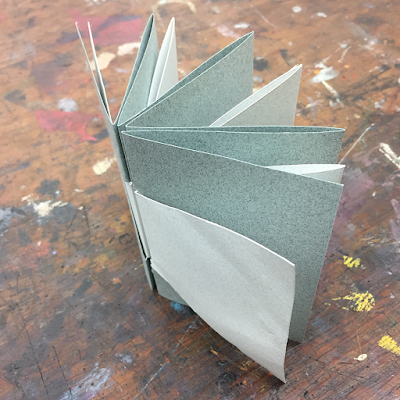 Today I made the Miniature Tabbed Accordion, with a wrapped hard cover - what a cutie! I'd like to make one with 5 tabs now, which I think would call for 12 panels. But is there a good way to attach one set of panels to another without it becoming too bulky? The address book you mentioned would have had more than 3 tabs - just wondering what people have done to achieve extra panels. Thanks! For thicker paper, I agree, folding a little tab at the end of each strip (p. 108) would make the whole book bulky. This technique is best for lightweight/textweight papers. as you can see, you can make it as simple or as tricky as you like! Thanks for all those tips, Alisa. And of course I missed the simplest solution - attaching the extra panels to the SPINE rather than the fore edge - my main concern was that I didn't want to spoil the eye catching tabs feature. I will look at your other page references too. I made 3 models yesterday, 2 with lightweight papers, but was also pleased with the one I made with slightly heavier decorated paper as the end panels are strong enough to act as covers. A VERY quick little book to make. I will be using this structure to make a card/book for a friend's birthday - the tabs will spell out her name (fortunately it is short!) and on the page behind each letter there will be various adjectives describing her that start with that letter. Thanks again for the tips and for producing this incredibly useful book! Alisa, I'm thoroughly enjoying your books and working my way through Expressive Handmade Books just now. I'm stumped on the Origami Pocket Pamphlet (pp.107-109), however. You have me until Step 9, where I assume you are to fold the bottom up and leave it there, then fold the bottom down. Is that correct? Then the directions are to turn the page, but even using Step 10 as a guide, I'm not sure about the next steps. Is there any chance of clarification? Much appreciated! Yes, fold the bottom up, fold the top down. Leave them. Make sure you do step 7, which is essentially reversing the triangular folds you just made. They should now be hidden between the front and back sections. The diagonal folds of the large triangle are now two peak folds, each. Now when you fold the top down and the bottom up you will see what looks like an arrow top and bottom. Turn the paper over and fold the matching piece down. Your paper will now be rectangular again. Fold the front section around. Fold the back section around. This can be done with more accordion folds to make more of these pages: Hedi Kyle's "Blizzard" book. Another version is her "Crown Binding" on page 53 in Making Handmade Books. Thank you, Alisa! I see what I was doing wrong. In Step 9, I was folding both bottom sections up and both top sections down at the same time, so at the end of Step 9 it was a rectangle already. I really appreciate your response! Is your "check book" model in this book? I saw it being taught but thought the first book I buy of yours should contain it. If that one model is any indication, I'm going to love working with your books! Instructions and photos are on pages 69-71. I have the 1998 edition of your book. Is the newer one different enough that I should buy it also? 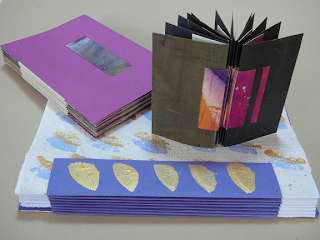 Creating Handmade Books has about 40 structures, the new one has more than 100. I've also perfected some of the instructions since then. Making Handmade Books has quotes from dozens of artists as well. Some of the material is the same, but there are also at least 12 new structures that don't appear in any of the other four books. It depends what you want to do and what you want to learn! Your local library may have a copy; you could check it out there, first, if you aren't sure. On the other hand, Amazon tends to sell it for $10-$12, which is a worthwhile investment for even just the new projects. Q: For the Western Multiple Signature, on page 149, Step 13. it states to "Make a wrapped cover or a hard cover for multiple signatures. (see page 208)" Page 208 does not show how to make a hardcover for multiple signatures and I can't find it in the index. Can you please direct me to instructions for a hardcover for multiple signatures? A: Good question. There are various hard covers you could use. As you found, the Wrapped Hard Cover is on p. 208; you could add a folded strip of paper for the spine to join the covered boards (shown in illustrations on p. 117). But I think you are looking for Case Binding: Flat Spine on page 213. Page 215 shows Attaching the Book Block to the cover. Also take a look at Multiple Signature with Rounded Spine (you don’t have to round a book under 1/2” thick) from page 157. This method can also be used for a book that is not sewn onto tapes.